However, the Great Recession, with a housing crash and soaring unemployment, effectively stopped household formation in its tracks. With jobs scarce, many individuals and families doubled up in apartments, fewer got married and the birth rate fell further. The good news, for the economy and housing in particular, is that household formation is rising again and is poised to pick up further as the economic recovery strengthens. Even with the dearth of new construction from 2008-2012, very slow household formation due to the poor economy resulted in fewer units needed annually and the existing inventory – which was high at the time due to overbuilding in some markets and foreclosures – was slowly worked down. Nationally, Jed Kolko, chief economist for the real estate website Trulia, estimates that relative to pre-recession trends, there were 2.4 million “missing” households in 2013. That is equivalent to roughly two years of normal household formation. 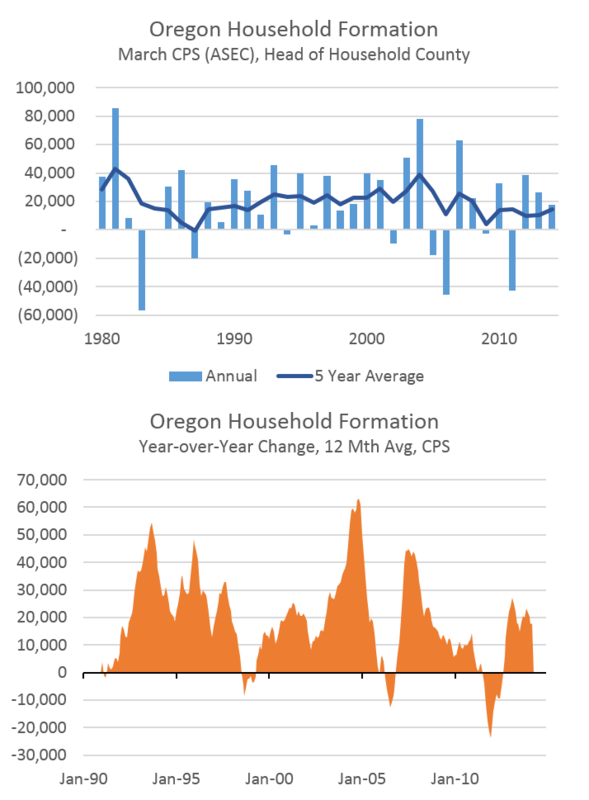 In Oregon, the number of households in early 2014 is about 50,000 below pre-recession trend levels which, similarly, is about 2 years of typical household formations in the state. The difference in the graphs is the top one comes from the Current Population Survey’s Annual Social and Economic Supplement which occurs each March, but only provides one data point per year. The second graph comes from the underlying monthly CPS data. Both are noisy given the small sample size for Oregon — about 1,000 households each month — but the trends are similar over time, as expected. Not only were families forced, economically, to double up during the recession as workers lost jobs and households were foreclosed upon, but more young adults continued to live at home as they were unable to afford to move out onto their own. In Oregon today there are approximately 80,000 more young Oregonians – 18 to 34 years old – living at home above and beyond the levels seen prior to the Great Recession. 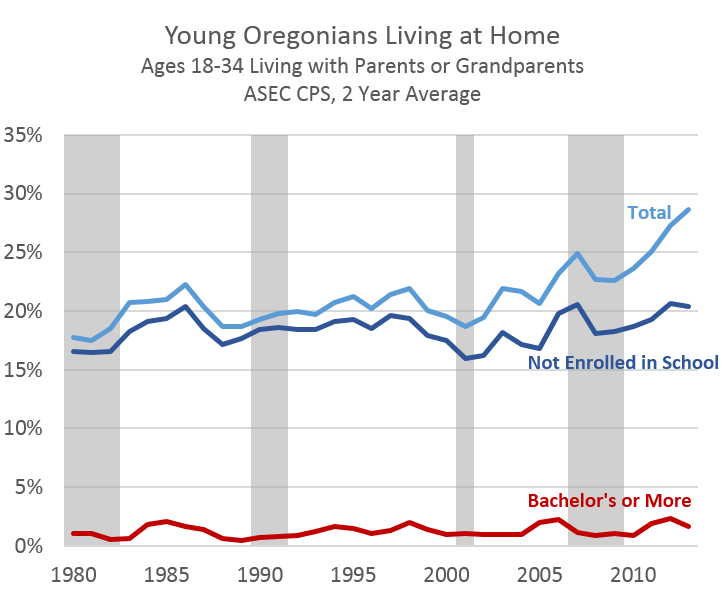 Through much of the 1990s and early 2000s about 20 percent of young Oregonians lived at home. Today it is nearly 30 percent. A silver lining, however, is that nearly 60 percent of this increase, nearly 45,000 individuals, are for young Oregonians who are enrolled in school and thus not participating in the labor market. The other 40 percent or so are living at home for other reasons, likely economic. One interesting note is that while a tough economic climate has made job finding mroe difficult, most young Oregonians with college degrees are not living at home. The number has nearly doubled, from a low of 8,000 to a current level of about 15,000 however this accounts for less than 2 percent of the living at home population today. These findings are also consistent with the recent Oregon Employment Department report on youth in the labor force that found that the share of so-called idle youth did not increase substantially due to the Great Recession. The combination of an improving economy and favorable demographics as the Millennials continue to age into their prime working years should result in stronger household formation moving forward. 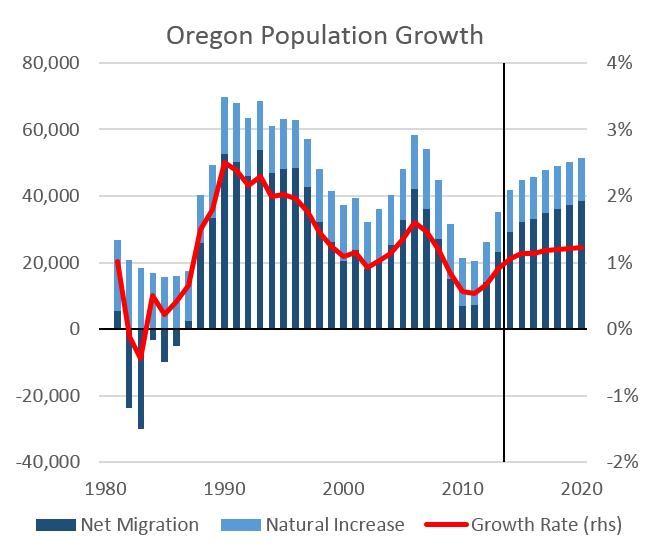 Already in Oregon growth has picked up in 2013 and early 2014 and net migration from other states has tripled in the past two years, making 2013 the strongest since 2008. While housing has not added much economically in the past 9 months, moving forward expectations are growth will once again resume as demand continues to increase. Depending upon your exact assumptions this figure is between 30,000 and 70,000 households below trend. This amounts to roughly 1-3 years of typical household formations.